As any architect knows, durable structures rise from strong foundations. The same is true of nonprofits. Organizational capacity and financial resilience provide the foundation that allows a nonprofit to advance its mission from a position of strength. Yet, both donors and grantees can ignore or fail to act on this knowledge. A Bridgespan review of financial statements spanning 2009 to 2014 from nearly 300 name-brand nonprofits with big budgets and successful programs — which together account for a third of the top 15 US foundations’ spending — found that shaky finances are, in fact, the rule. More than half (53 percent) experienced recurring or chronic budget deficits in at least two of the past five years. And 40 percent had fewer than three months of reserves to cushion all-too-frequent shortfalls. In fact, 30 of the 275 organizations had no reserves — making them technically insolvent. What’s needed, the study clearly revealed, is an operational model that supports strong programs and strong organizations. Inspired by this belief, Bridgespan developed, and then refined with the Ford Foundation, what we call the Grantmaking Pyramid. 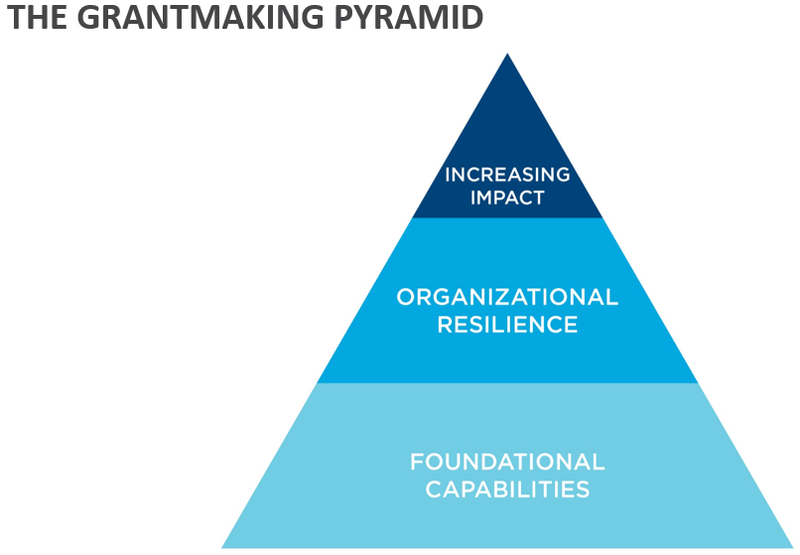 This philanthropic framework rests on a wide base of foundational capabilities, rises through organizational resilience, and is capped by increasing impact. Foundational capabilities means having enough funds to cover the costs of such core functions as strategic planning, information technology, staff development, utilities, rent and travel. Nonprofits also have to cover other capabilities essential to fulfilling their missions. For example, an advocacy organization requires excellence in strategic communications, while a medical research lab requires specialized facilities. These represent the hidden strength, or weakness, of any nonprofit and provide the platform for deploying effective programs. Increasing impact means delivering effective programs, which is where funders and grantees naturally focus their attention. Every nonprofit begins with a laudable program or service goal, and funders are eager to support them. While outright growth or scale is not always the best goal, success fuels a desire to increase an organization’s impact. But overemphasis on the top of the pyramid effectively hollows out the rest. Too often, Nonprofits must spend scarce unrestricted dollars to fill funding gaps rather than address critical priorities, such as staff development or IT infrastructure. The inability to cover operating costs shows up in persistent annual deficits. Those deficits quickly deplete the meager operating reserves nonprofits manage to save, which can force borrowing from restricted funds. More than a theoretical model, the Grantmaking Pyramid is the basis of the Ford Foundation’s new BUILD initiative, a $1 billion investment over five years in some 300 grantees. BUILD seeks to create demonstrably more powerful civil society organizations and networks working to address inequality around the world. The foundation launched the initiative in 2016 after a self-assessment revealed that it typically paid too little toward indirect costs, and its one- and two-year grants made it difficult for grantees to plan multiyear strategies. The findings also prompted Ford to raise its indirect-cost reimbursement rate to 20 percent on all project grants and to move to general support grants as the default whenever possible. All big donors — not just well-established foundations — should think about how they can help build strong organizations, not just strong programs. In particular, they should: (1) identify specific foundational capabilities they are willing to support; (2) ask grantees the true cost of their programs, and be prepared to help them do what it takes to deliver these programs from a position of strength; and (3) support grantees in building operating reserves. Such an effort may require donors to think differently about how we invest in successful nonprofits. But we believe it can help those nonprofits create deeper and more lasting impact. This article was written by William Foster from Forbes and was legally licensed through the NewsCred publisher network. The information in this article is presented as-is and does not necessarily reflect the views of First Republic Bank.